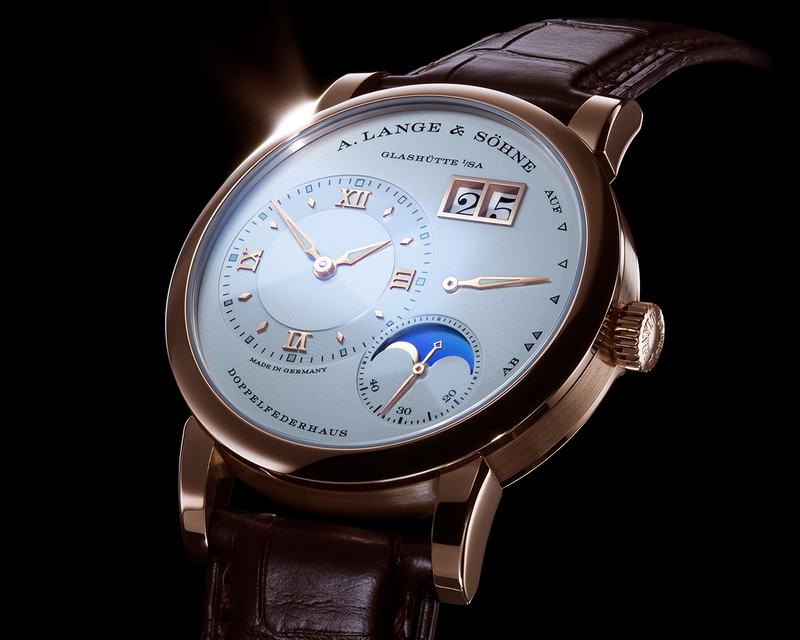 At SIHH 2017, A. Lange & Söhne enriched its most successful watch family, the Lange 1, with the Lange 1 Moon Phase. The most coveted and admired complication takes a new, realistic approach thanks to the combination of the moon-phase display and the day/night indicator. The moon-phase display remains, to date, one of the most admired and sought after complications, in a timepiece. This is true at such a level as to inspire the watchmakers’ work in order to track and render the moon’s revolution in a more and more perfect and realistic way. The Lange 1 Moon Phase, then, is so precise in tracking the lunar cycle that it takes 122,6 years for the display to deviate from the synodic period by just one day – a cycle that has an average duration of 29 days, 12 hours, 44 minutes and 3 seconds. The remarkable details are in the moon-phase display, that reaches a new level of realism. All in solid gold, the moon follows its orbit in the foreground. Behind it, the celestial disc, also in solid gold, performs its revolution. The realism of the scene is rendered by the shades of blue that highlight the change of light according to the passing of time during the day, in an alternation of bright blue sky and dark night with laser-cut stars. From a more technical point of view, the Lange 1 Moon Phase’s movement is the calibre L121.3, manually wound, all decorated and assembled by hand, and it consists of 438 parts. The movement includes the twin mainspring barrel, its maximum power reserve is of 72 hours and the jumping outsize date display, like in the Lange 1’s L121.1. Additionally, the Lange 1 Moon Phase features also an escapement with a cam-poised balance and free-sprung Lange hairspring. Its heart beats at a frequency of 21,600 semi-oscillations per hour. Ladies will not be disappointed, as the mystery and aura of the moon will stay with them, too. The Little Lange 1 Moon Phase is in fact a timepiece that distinguishes itself by sheer elegance and a very interesting interplay of colour and structure. The Little Lange 1 Moon Phase’s beauty resides in the harmonious visual balance between the warm gloss of the polished pink gold case and the exquisite guilloched, argentée-coloured dial. The celestial disc of this model is also argenté-coloured. And the chromatic harmony continues thanks to the choice of colour of the timepiece’s strap, that comes in white alligator, secured with a pink gold prong buckle. The Little Lange 1 Moon Phase’s movement is the calibre L121.2, manually wound and with the same characteristics as the L121.1. The movement’s hand-finish is fully visible through the sapphire-crystal caseback. I do agree with you, especially the Little Lange 1 Moon Phase, where you have everything, from my point of view: exquisite chromatic balance, the guilloché dial, the moon phase.